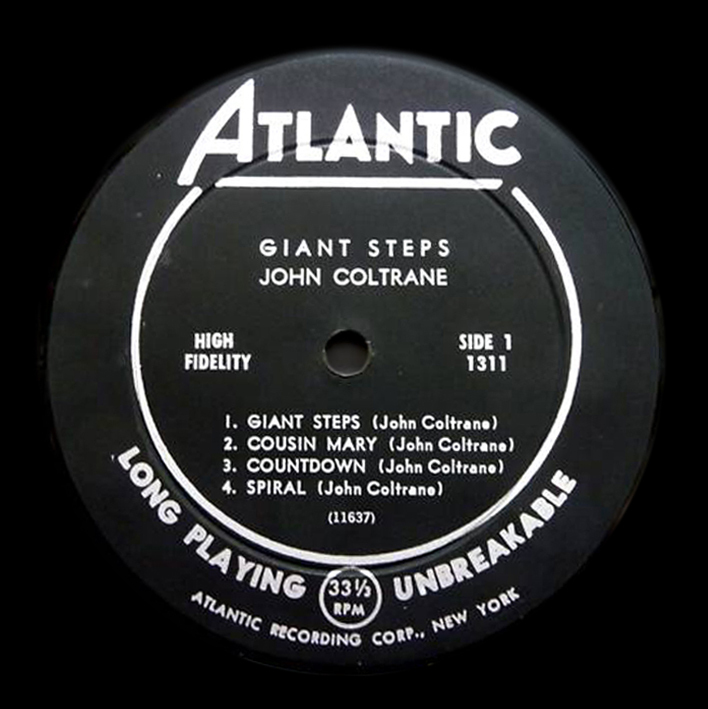 Which is the “original” Coltrane Giant Steps? The one on the left, of course: the First of the First. Label detail is inconveniently (or conveniently) lacking in many auction seller descriptions. Charitably, they were all waiting for the LJC definitive Guide. No excuses, here it comes. Well, first attempt. 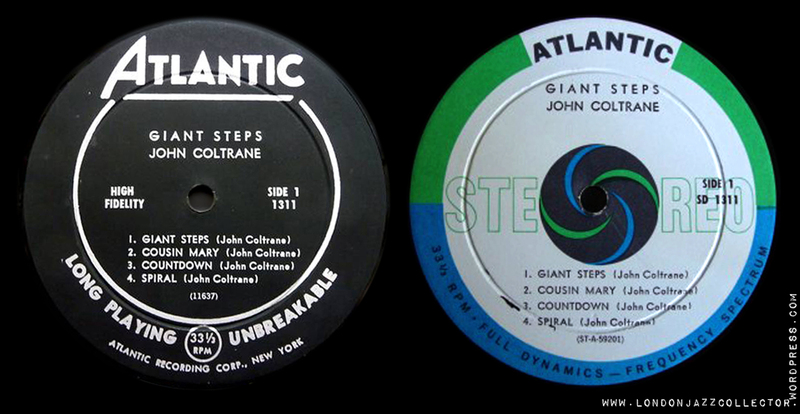 Ornette Coleman and John Coltrane are just two good reasons to become familiar with Atlantic. My first stab at this label in a title by title forensic guide, completely is evidence-based – you see, not I say. 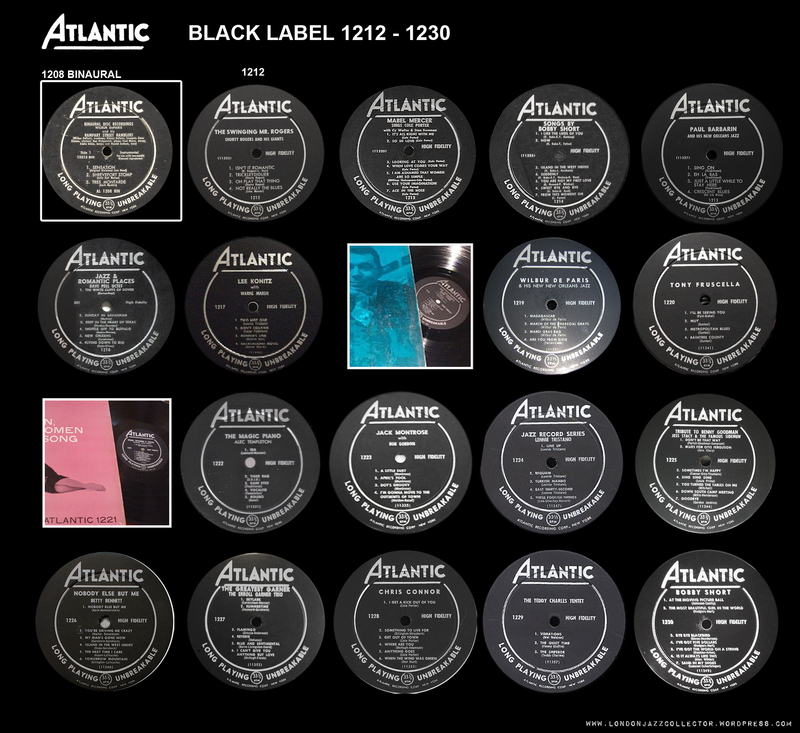 From 1212 to 1304 the 1st label is always black. Atlantic seems to have had an orderly manufacturing process, not like small independent jazz labels who cannibalised old labels. 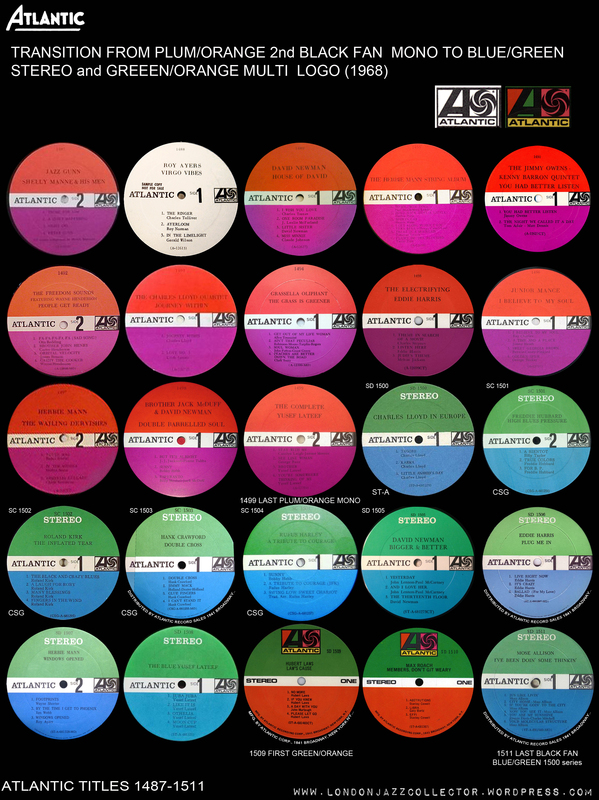 With the 1300 series, matters become a more complicated, especially as revenue streams were sought from reissues alongside new titles. 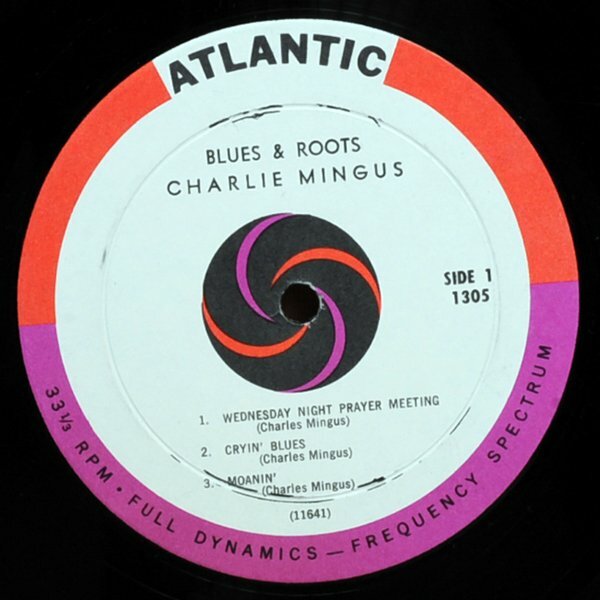 Contrary to my expectations from general Atlantic labelography, detailed research title by title reveals the “bullseye” design which some refer to as the “pinwheel”, appears only for selected releases, starting with 1305 Mingus Blues and Roots, whilst the black label continued in general use. The bullseye label did not “take over” from the black label. Pictured below are those titles where the bullseye is the 1st release (ie there is no earlier black label found) and those where an earlier black label is found. The bullseye was also used for some second pressings of earlier back label titles – not shown here. 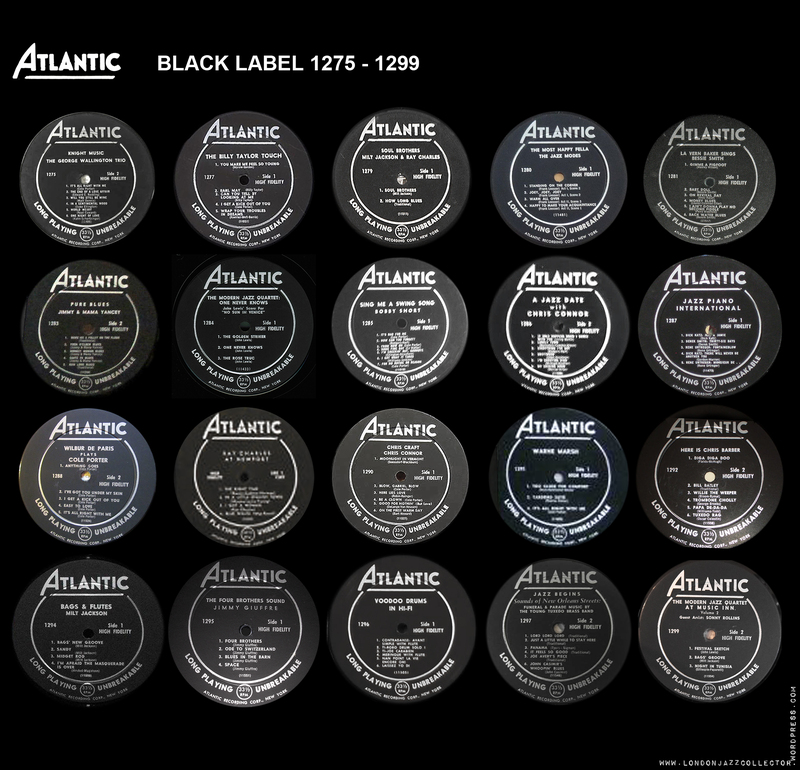 The black label was phased out at 1332 and the Plum/Orange White Fan label took over as the main Atlantic label for new releases and reissues. This was news to me, I hope I have got it right but that is what the examination title by title suggests. The existence of a black label is definitive. More than a few pinwheel are second pressings, several years following the black label. 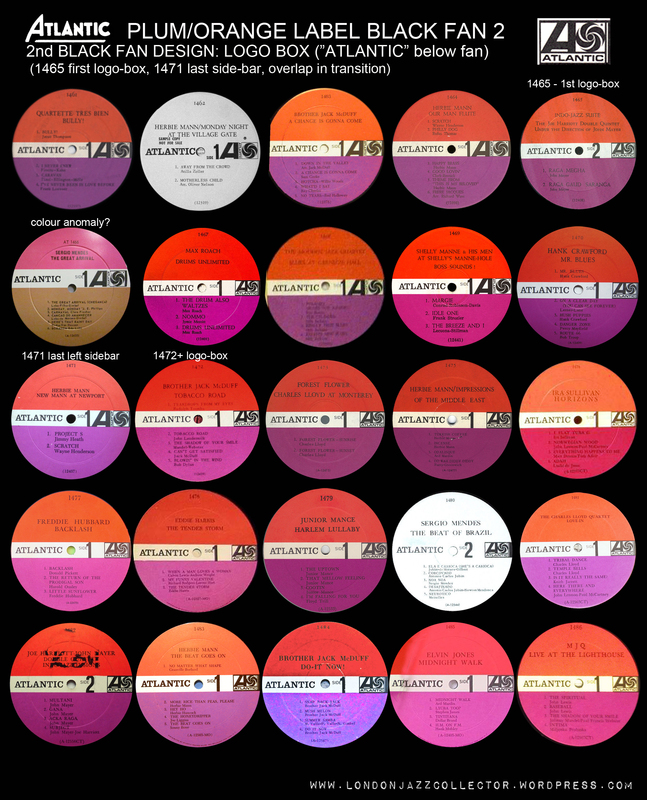 There is no evidence that different pressing plants unilaterally decided to issue different labels, or there would be more evidence of chaotic variation than is the case. 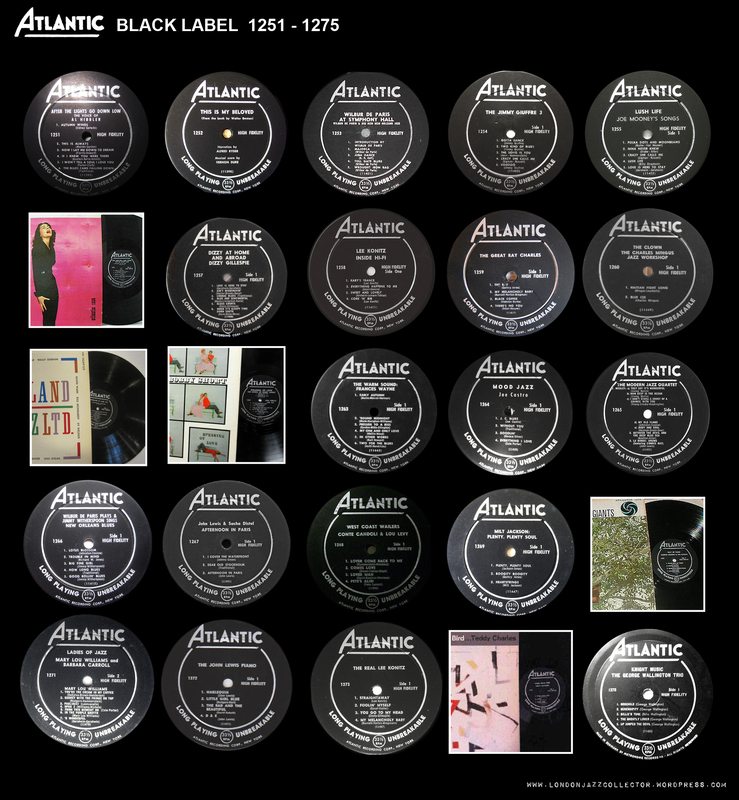 All possibilities need to be considered, but looking at the choice of titles on which the first pressing is on the pinwheel/ bullseye (ie a black label is not found), these are no doubt high-profile prestigious release for Atlantic, and that is where I think the better explanation is likely to be found. That is my hypothesis. See that long run of black labels which continues after the pinwheel first appears, then a continuous run of plum/orange. 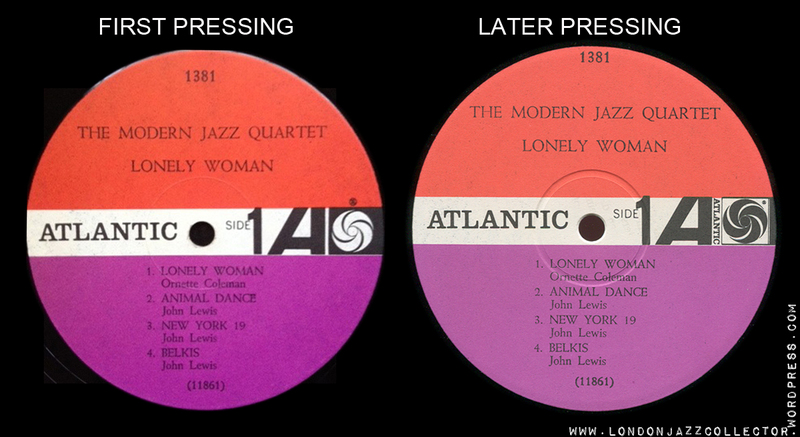 The pairing between mono and stereo original pressings is not always symmetrical. For example where you might expect the plain green stereo equivalent to the plain black, there is the green/blue bullseye (possibly by reason of the time-lag between release of the mono and stereo editions). Gentlemen, gentlemen, they can’t all be “originals” can they? Transition from Black label to Plum/Orange Black Fan via the white fan, replaced by black during 1962. 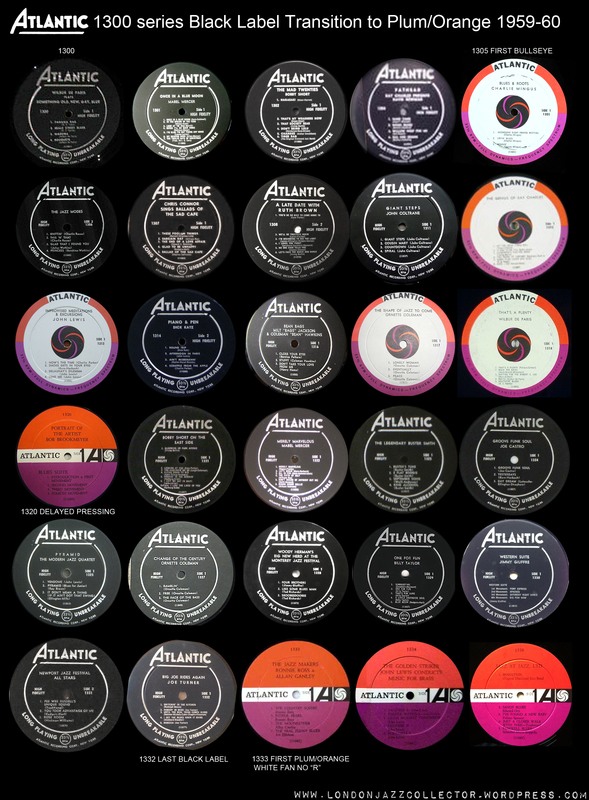 Many of this series were first issued in white fan, reissued in black fan. The fan-colour is the essential identifier of provenance. 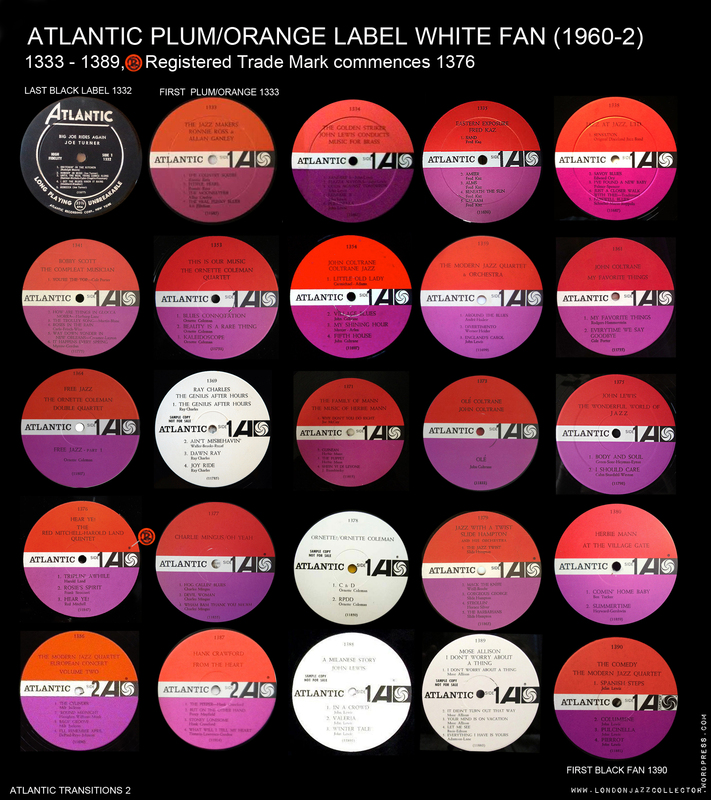 (Work in progress) This is a fairly mammoth task, but it is clear there are two important design variants which effectively “datestamp” a plum/orange black fan label – the “Atlantic” name appears in the logobox either as a vertical left sidebar (up to 1966), or later as a horizontal footer from 1966-68. Black Fan/Left Sidebar kicks in at Atlantic 1390. 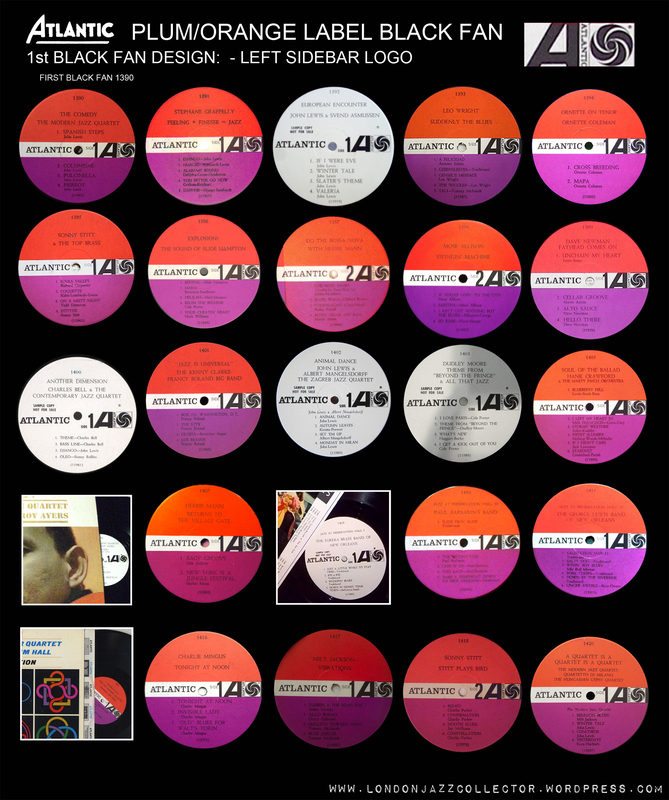 During research I came across a good number of especially Herbie Mann titles which were first released on Black Fan/Left Sidebar which went on to be reissued on Plum/Orange with Black Fan 2nd design, “ATLANTIC” below the fan, which was in use 1966-8. The catalogue number of the 1500 series is re-branded SC 1501 (stereo compatible, for mono users?) instead of SD. False alarm, the new SC identity reverts within a few titles to the familiar SD catalogue number, leaving only collectors baffled.Strange things happen in the footer of the label. Suddenly, sales distribution is credited to Atlantic, then suddenly manufacturing credits appear. 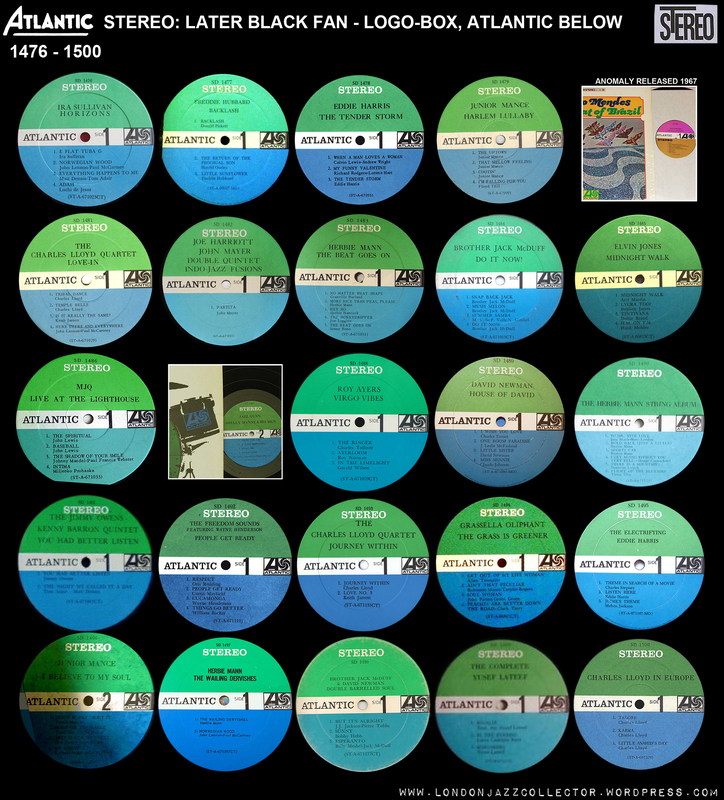 From SD 1512 onwards the green/orange/multi maintains the continuity of label for first pressings in the 1500 series. None of this matters except if you are concerned about the provenance of a record, particularly its’ status as an “original pressing” . In the course of this research I have seen the over-used word “original” in countless auctions where it does not stand scrutiny, to a large extent due to the lack of knowledge on the part of sellers. It’s a nice word, and if no-one really knows, why not? As far as Atlantic is concerned that is now game-over. Still to follow: -Stereo, though that would appear much less complicated, plain green label becomes blue green, easy peasy. I hope*. :Stereo is wearing me down! I will return to it at a later date. Never mind the labels, LJC, what about the music? 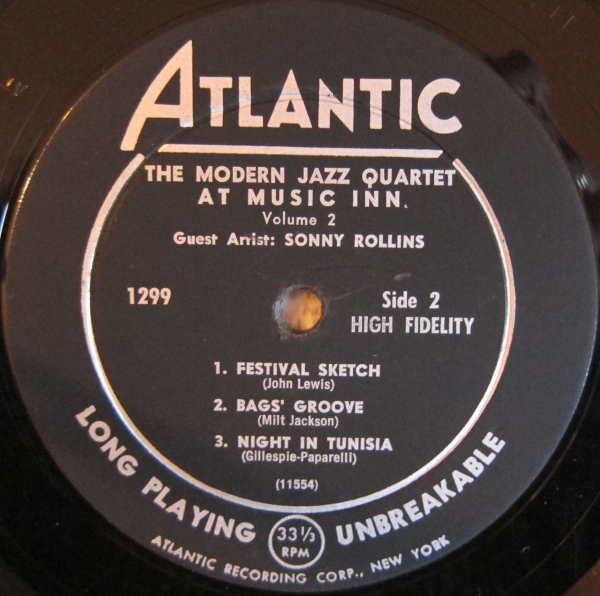 The Atlantic Jazz 12″ 1200 series is extraordinarily diverse. Along side the pioneering cutting edge of Mingus, Coltrane, and Ornette, and the soul of ray Charles, there are Dixieland and Southern Heritage, Avant Garde numerous popular jazz singers like Chris Conner and a stable of others with little lasting appeal, lots and lots of Herbie Mann, more than a few novelty records, a mirror to American life in the Fifties and early Sixties. Some things to treasure, and a few things better forgotten. The long run of the Plum/Orange Black Fan through to the eponymous Red/Green label between 1962 and 1968 contains fewer interesting revelations and wanders into less musically interesting territory.Coltrane moved to Impulse, and Atlantic focussed on the emerging teenage markets for rock and pop. 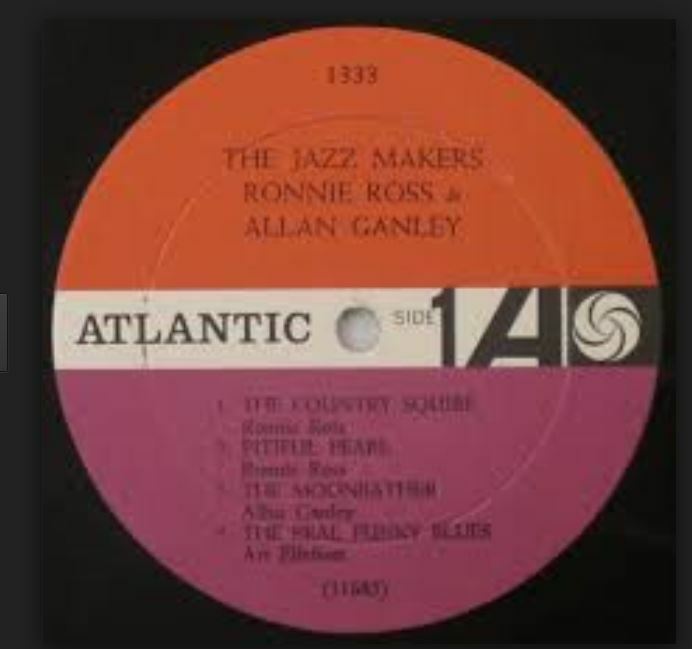 The markets had spoken, Atlantic jazz was a spent force except for reissues from the back catalogue, but they left a rich legacy from the early years, and thank them for that. Can anyone comment on when original jackets stopped having lamination on them? Can’t say for certain but I think laminated covers continued at least a bit into the green/orange label era. Amusingly I say this based not on a jazz but a rock record as I own a copy of MC5 Back in the USA that has a laminated cover. I’ve also seen stock(?) laminated covers on green/orange label reissues (I have Coltrane Ole and Blues and Roots on green/orange labels with laminated covers). Mind you I’m talking the early green/orange labels with the Broadway adress in large font at bottom which I think was in use up to the early seventies though I’m not sure of the switchover date. I have a copy of Milt Jackson’s “Plenty, Plenty…”(1269) with black label exactly as depicted in your catalogue but with no deep groove. Can it be considered an authentic 1st pressing? 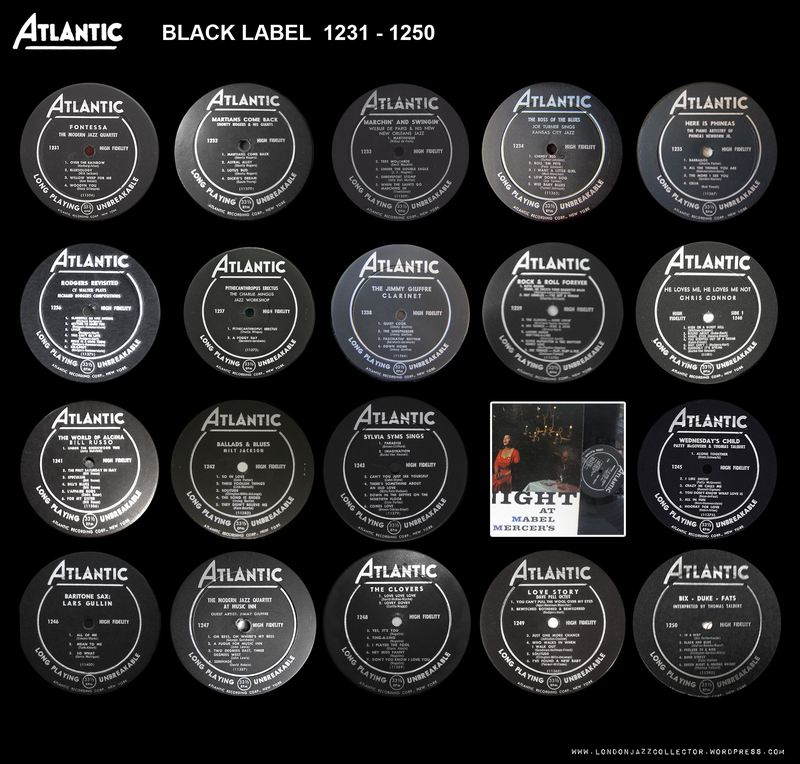 There are just a couple of non-DG pressings near that number in my table – 1273 and 1287. I chose those shots because that’s alI found when doing the research. First pressings are rare and I couldn’t find a DG picture for those titles. The non-DG of 1273 is still there in Discogs. 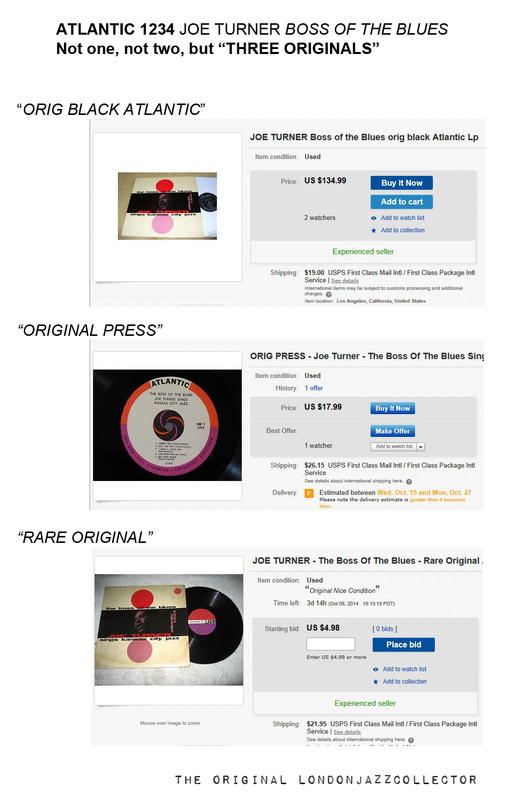 A check on Popsike will tell you if there is a DG copy among top auctions, but it’s no way to source a picture of the label, as they invariably use only the cover photo. I think you have a second pressing, made within a few years of the original – while the black label was still the official 1200 series design. OK, found the green – is there a scan of the 1st Atlantic label – gray w/ Atlantic in white? Sorry – Unless I’m missing it. you don’t have the orig. stereo Green label. Once again, I can provide if you’d like. You’re missing the 10″ gray label (used for only 2 releases, I think) and the yellow variations (what’s that by Elgar??) I can provide ir you’d like. Plum and Tan stereo – I have seen that colour combination, attributed to 1967. I can’t date anything conclusively but Atlantic were in the habit of throwing up anomalies, special editions and one-offs, so nothing surprises. The plum and tan label anomalies are RCA club pressings. Apparently, it was more economical for them to make one label based off the ATCO stereo color scheme, and print either the Atlantic or Atco logo over it, and a stereo banner underneath if needed. I have a SD1312 (The Genius of Ray Charles) on a plum/tan black fan with left sidebar Atlantic and “STEREO” stamped across the label. A color anomaly combined with the apparent re-use of old label stock. Any thoughts of when this might have appeared relative to the usual stereo lablel?